Taito loses its groove with this flowery disaster. We knew there was something off about Drawin' Growin' the moment we laid eyes on its 30-page tutorial. The virtual booklet breaks down every little detail, from guarding against UFOs (and meteors, volcanic rocks, icicles, snow, ash and sand) to monitoring a plant's health meter. In practice, the app's less intimidating, and we admit to downloading it as a good faith gesture that Taito earned from its previous (and highly entertaining) iPhone and iPad release, Groove Coaster. Sadly, the developers failed to bring some of that game's magic into this one, and the result is a boring, borderline frustrating title that'll anger players that have trouble multi-tasking. The concept appears simple enough. 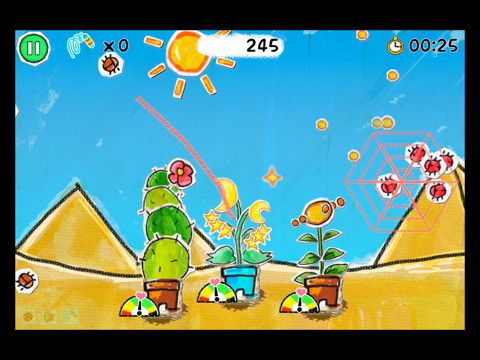 To beat each stage, you must draw lines on-screen to direct sun and water drops to the appropriate plants and make them grow, while tapping away bugs and braving the elements. You can only draw a limited number of lines, so it's a process of constant erasing and adjusting to make sure the droplets reach the intended destinations. 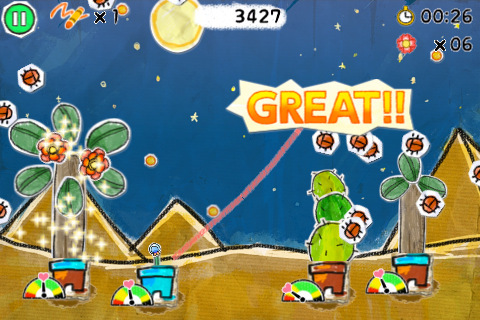 Meanwhile, you must keep the wrong droplets from reaching different plants (sun drops, for instance, shouldn't touch a plant that requires water) or they'll hinder the growing process, hence the individual health meters. It's a silly concept made worse by monotonous play. We struggled to find any enjoyment from haphazardly sketching lines on the screen and watching droplets slowly roll towards the desired target while the wrong drops appeared en masse to screw things up. On top of that, Taito tries to get players to spend real world cash on gold, necessary for buying power-ups. That's fine, but the boredom we experienced with each passing second didn't inspire us to part with more dough, not after regretting the initial $0.99 spent to buy this mess. The quirky art style makes Drawin' Growin' stand out, but some weird looking characters failed to save this uninspired and weak effort. Taito, we expected better. What's Hot: Colorful backgrounds, universal. What's Not: Too frustrating and monotonous, silly concept.